The Bowflex is a popular home gym providing a wide variety of strength building exercises in a rod resistance setup that takes up only a limited amount of room. 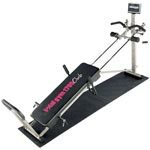 Its creative design allows the user to perform a wide range of exercises available at their local gyms at home, and there are several version of the bowflex home gym. 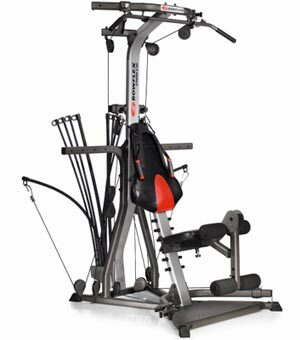 The Bowflex Extreme 2 SE home gym is higher model of their "slimmed" down bowflex home gyms. It doesn't offer quite as many exercises as the Bowflex Ultimate, but offers slightly more than the original Bowflex xtreme home gym - hence the name Bowflex Xtreme 2. 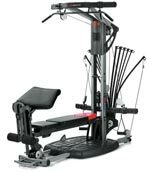 Like the other Bowflex home gyms, it's based on the rod resistance machine, and the standard machine for this version comes with up to 210lbs of rod resistance, which is upgradeable to 310lbs or 410lbs, which should suffice for very strong individuals. 210 lbs of Power Rod Resistance - Bowflex Xtreme 2 Power Rod units give you resistance, or weight, that feels as good as free weights. Its upgradeable up to 310 lbs / 140 kg or 410 lbs / 186 kg! Revolutionary No-Change Cable Pulley System - The Bowflex xtreme 2 lets you move from squats to lats to leg workouts without ever changing cables. That means you'll save time and keep your heart rate up as you progress through your workout. Lat tower with Angled Lat Bar - Build back and shoulder muscles quickly with this integrated tower. 4-Position Lower pulley/squat station - Bowflex extreme 2 comes with a 4 position lower pulley / squat station that allows you to do squats and build your glutes, hamstrings and quads. It also comes with a leg extension and leg curl attachment. Abdominal Crunch Shoulder Harness - This version of Bowflex extreme 2 offers an all new ab harness and ab pulley bar to help you build strong, defined abs. Ergonomic adjustable seat with Polyurethane cushion - The bowflex xtreme 2 also offers a new design in the seat cushion that provides added back support for leg exercises and knee support for lat exercises. 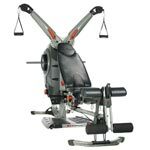 Below is a detailed list of the Bowflex extreme 2 home gym features. The Bowflex Extreme 2 home gym is a superior product, and Bowflex provides a guarantee that stands behind it. Your satisfaction is guaranteed. 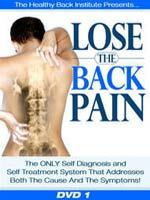 Just purchase your machine and workout for up to six weeks. If you're not 100% satisfied with the results, simply contact the Bowflex customer service department for Return Authorization.